Museo Naval de Madrid, based at the Spanish Navy Headquarters, is a national museum in Madrid featuring Spain's maritime history. 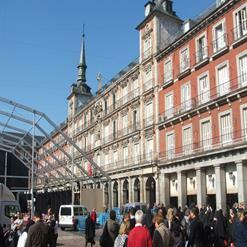 Also known as the Naval Museum of Madrid, the museum houses collections of items featuring the series of objects collected by Spanish sailors, uniforms, weapons, flags, navigation instruments as well as collection of figureheads. In addition to this, there is also collection of detailed models and paintings of ships along with modern navy collection including two aircraft carriers, ten frigates, four submarines, and a host of smaller ships.